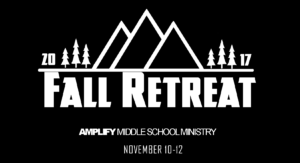 We are one week away from our annual Middle School Fall Retreat! You may have some questions regarding what to bring, what time to drop off your students, etc. If you do not find the answer to any of your questions below please feel free to contact Joe Yarbrough, 270-709-5900, or jyarbrough@loneoakfbc.org. What time do I drop off my student on Friday, Nov 10, and where? Drop off your student at 6:00PM. Check-In’s will take place in the MPR at LOFBC. Does my student need to eat dinner before? No, we will have dinner at 6:30PM in the youth lounge. What all is involved with Checking in? Parents, come inside with your student, have them bring their luggage and place it in the designated area. Then, proceed to the check-in station where one of our volunteers will make sure you have all of your forms filled out. When do I pick my student up? You may pick your student up, Sunday, Nov 12 at 11am in the MPR at LOFBC. The basic essentials needed for the Fall Retreat are: Bible, something to sleep on/in (air mattress, cot, or sleeping bag), change of clothes (Saturday and Sunday), toiletries, towel, and a snack to share at their host home. They are allowed but not encouraged to be used during the retreat weekend. If your student bring their phone they may be asked to leave it off. Emergency Contact #’s will be given out for every host home group. They are homes of church members who have graciously opened up their homes to provide a safe and comfortable place for your student to spend the night with their small group on Friday and Saturday. What all is a host home responsible for? Host homes are responsible for helping transport your students to and from church, provide a space to sleep either on the floor or in a bed/couch, and provide breakfast on Saturday morning. Posted in Amplify on November 3, 2017 by Joe Yarbrough.